Fight Card Entertainment presents “Undisputed” on June 18, 2011 at the Sundance Saloon in Waukegan. 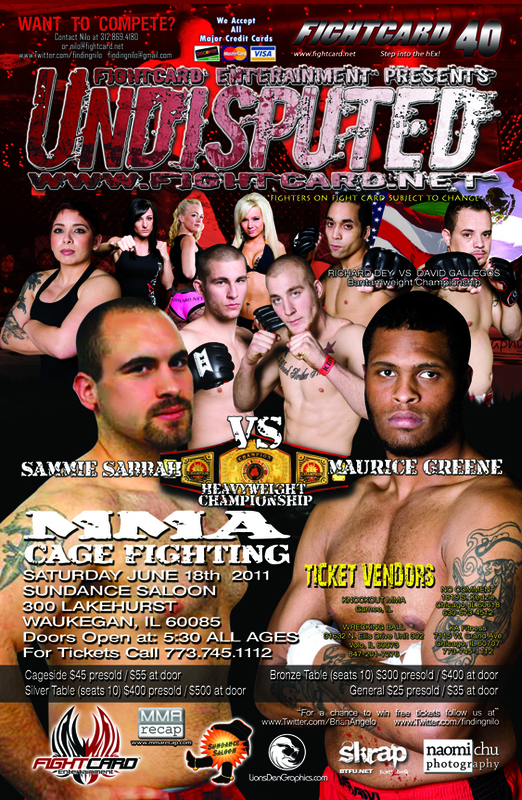 The card features an interim heavyweight title fight between Maurice Green and Sammie Sabbah. The co-main event is a bantamweight title bout between Grayslake’s Richard Dey and Dave Gallegos of Chicago. “This is going to be our 40th event and the fans deserve a big main event, Greene versus Sabbah for the Interim Heavyweight Title doesn’t get any bigger,” said FCE’s Brian Angelo.